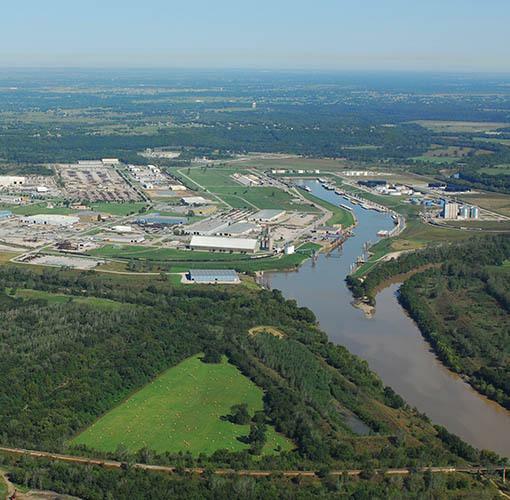 The Tulsa Port of Catoosa is one of the largest, most inland river ports in the entire 25,000 miles of U.S. inland river system. It is the head of navigation for the McClellan-Kerr Arkansas River Navigation System running 445 river miles from Northeast Oklahoma to the Mississippi River. With worldwide access capabilities and our newly renovated dock products can travel easily and efficiently from America’s heartland to the rest of the globe. Opened in 1971, the port currently has 72 industries within its 2,500-acre industrial complex. Whether it’s agricultural commodities, building materials, petroleum products or machinery, it can be shipped in and out of the Tulsa Port of Catoosa daily using a combination of barge, rail and truck.